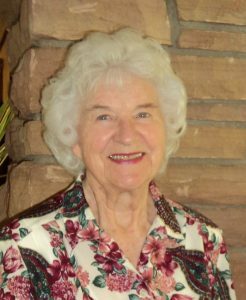 Ellen Bone Clark, 94, passed away peacefully Monday morning, March 27, 2017. Ellen was born on June 16, 1922, in Provo, Utah. She was the sixth of eight children born to John Wesley and Judik Noorlander Bone. She married Angus MacKay in 1941. He was killed in World War II at the Battle of the Bulge in Germany. After the war, Ellen went to college in Provo and Logan. She met Craig Clark while attending Utah State University. They were married in Provo in 1949 and made their first home in Palisade, Colorado. Two years later, they moved to their farm in Beryl, Utah. In 1974, they moved to Newcastle where Ellen became postmaster. While there, she was instrumental in getting the new post office built. She retired after her 80th birthday, having served as postmaster for 30 years. She was the oldest Utah postmaster at the time of her retirement. Ellen is survived by her husband, Craig Clark, her son, Gary MacKay (Judy), and her two daughters, Rosalind Roth (Stephen) and JoAnn Eckley (Earl). She has five grandchildren and five great-grandchildren. Funeral services will be held Friday, March 31, at 11 a.m. at the Newcastle Ward Chapel. The viewing and visitation with the family will be Friday morning from 9:30-10:30 a.m.
Interment services will be at 3:30 p.m. at the Springdale Cemetery. Arrangements are made under the direction of Spilsbury Mortuary, 435-673-2454. Friends and family are invited to sign her online guestbook at www.spilsburymortuary.com.